Alameda residents have been building, rebuilding and changing the neighborhood now for more than 100 years. While most of the initial home construction in Alameda took place in the 1920s, a look back through historic building permits reveals a constant stream of repair, remodeling and renovation. History-inclined neighbors with an appreciation for period detail will agree that some of this work has been for the good, and some…well. That’s life: change is the constant. 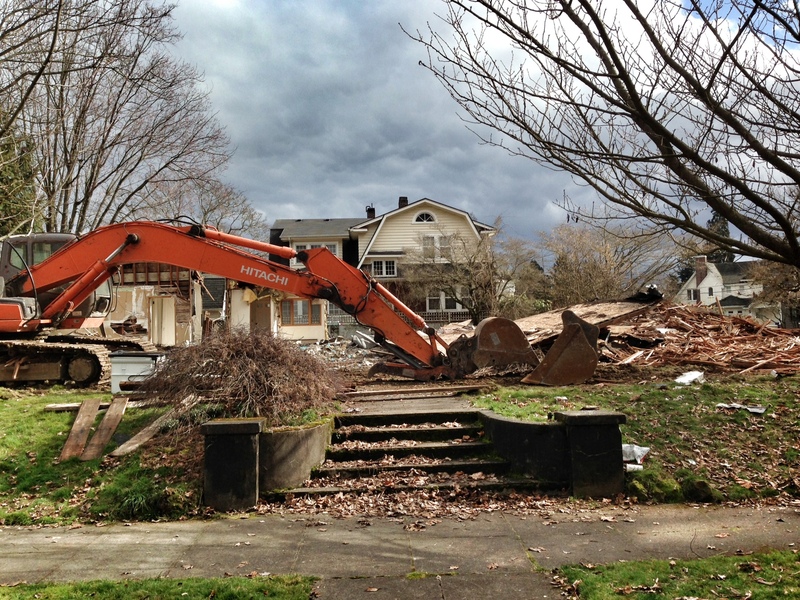 This spring, change continues to shape homes here in Alameda. A strengthening real estate market, low interest rates and an improving overall economy have meant homeowners and developers are more willing to invest in work. Alameda and other nearby northeast Portland neighborhoods have experienced an 18.4 percent increase in real estate values over last year at this time, according to the Portland Business Journal. In the first quarter of 2013 alone, there were 62 pending and closed property sales in the neighborhood. The result of this strengthening market is plainly visible in the form of renovations, additions, complete tear-downs, and partial re-builds. Here are a few of the visible projects we’ve seen progress on during our walks through the neighborhood. Not an exhaustive inventory of major works underway, but a list of interesting projects to watch. As of mid-May, this double lot just north of the Alameda Ridge is a hole in the ground where once stood a stately 1922 Mediterranean style home built by Frederic Bowman. The home was demolished in February, and the lot subdivided in two. As a demonstration of Portland’s policy on infill development and the improving market conditions, developers of this project closed the door on the possibility of adaptively reusing the original structure, subdivided the lot, and decided to start over from scratch. Neighbors had to say farewell to the historic home, and now get to watch as construction of two houses unfolds—both with architectural styles that will attempt a linkage with the past. 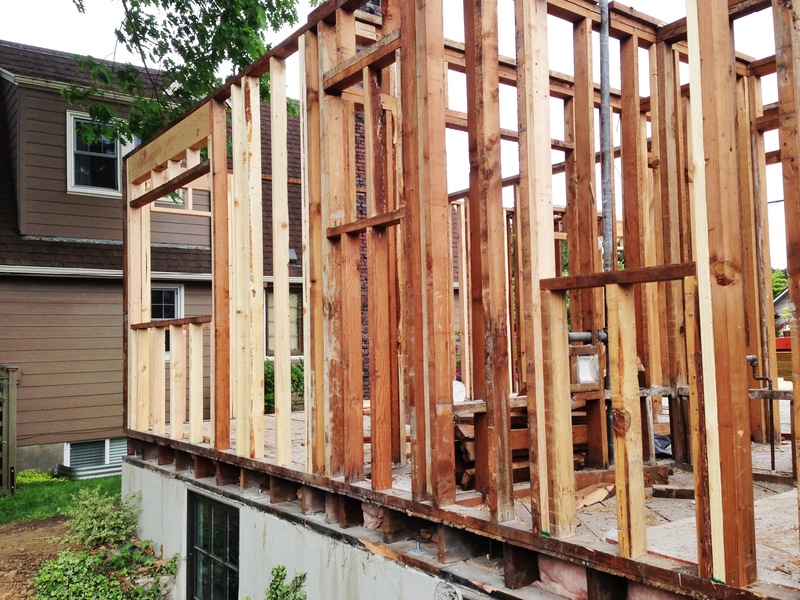 OK, it’s technically just east of the Alameda neighborhood, but it’s a particularly interesting project to watch because the new structure is using some of the original materials and structural elements. We watched as the house was disassembled this spring and it looked like much of the original building material was stacked and recycled (unlike the demolition at 28th and Hamblet). Entire interior partition walls are being repurposed, and even window headers and doorframes now feature some old and some new material. Original foundation walls have been retained and new sections added. We remember this as a bungalow. This home at NE 37th and Bryce presents a reuse of existing structures and new materials. The old framing lumber appears dark in this picture, and new material is a lighter color. 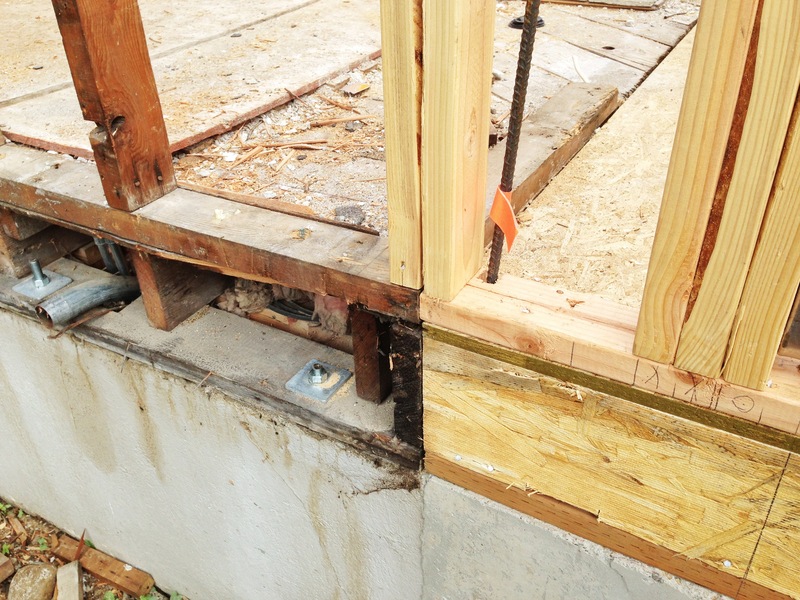 A detail of the home at NE 37th and Bryce showing the original foundation, exterior wall and flooring system (left), joined with a new foundation and materials (right). Construction and remodeling projects across the neighborhood this spring are using a range of old and new materials. This corner bungalow has received a major facelift this spring. In the past, this house has been unsure if it wants to address the 21st Avenue side or the Regents side. Today, the house connects with both streets in its unusual position at the prow of the neighborhood. Siding, landscape and other upgrades are apparent. Major reconstruction work on the bungalow on the west side of the street in the first block south of Fremont has removed the former Mansard-style roof (which was not original), expanded the footprint, and added back several traditional design elements including columns and a new front porch. Elements of the original house were retained and blended with a major expansion to the north, a new front porch (still underway), a completely new roofline and exterior shingles on the upper storey. Work on this house is almost done now, but has involved a complete restoration both inside and out. Most of the original fabric of the home is still intact. This has been another interesting one to watch this spring. One thing is for sure: in a neighborhood of older homes and with an improving real estate market, continued investment and renovation will shape the neighborhood. Do you have favorite home restoration projects you’re watching? Seeing as how the English Tudor Cottage stories and photos are among the most often viewed files here on the blog, I thought I would share an article and drawings that ran in The Oregonian homes section on December 20, 1925 (click on the image to enlarge). Interesting to note that plan sets like this were available in abundance. Every week, the newspaper focused on a different house style: the narrative describing each house could have been the same for every story, favoring words like roomy, inexpensive, tasteful, convenient. If you live in a Tudor, does this floor plan and design look familiar? There aren’t many of these in the neighborhood, so they tend to stand out proud and clear: the Mediterranean, with its distinctive tile roof and stucco exterior, is a time traveler from a very specific period in Portland’s residential architecture history. This home at 2506 NE Ridgewood, built in 1925 by Emil Johnson, is a classic example of the Mediterranean style in the Alameda neighborhood. Current resident Clayton France is underway with restoration work. First beginning to appear with the housing boom of 19-teens and early 1920s, the Mediterranean style quickly became popular, with multiple grand homes built particularly in high-end Portland Heights and Willamette Heights neighborhoods, but also with more modest versions scattered through Irvington and Alameda. While much of the surrounding housing stock of the time was clad with shingles, clapboards and the distinctive angular features associated with the Craftsman era, the Mediterranean style offered a more exotic and even romantic feel. Characteristic design elements tie to centuries-old classic materials and structures, including terra-cotta tile roofs, graceful archways, white-washed smooth stucco exteriors, and hipped-roof towers. Look for small porch-like tile-roofed entries (called loggias), and long narrow—often arched—casement windows. All of these features conjure up romantic visions of Tuscan villas, rolling hills and established old settlements rooted in generations of storied history, which of course young Portland didn’t have a lot of in the 19-teens. But the appeal of this stylistic message, particularly here in a brand new neighborhood at the edge of a booming western city, was clear enough for some speculative home builders to give it a try. A perfect example of the style here in Alameda is the home at 2506 NE Ridgewood, built in the spring of 1925 by local builder Emil Johnson. Johnson, and his younger brother Ernie Johnson (both Swedish immigrants, and both home builders) were busy in Alameda and Irvington during these years, but this is the only Mediterranean he built. Johnson designed and built this house, and likely took special care in its construction because it’s where he and his family lived (his daughter Eileen lived in the house all her life). Look at the arched and roofed front entrance, the long casement windows, the terra-cotta roof tiles, the hipped-roof stair tower at the entry, and the wrought iron balcony railings: design elements that trumpet the Mediterranean-Italian connection. Like so many aspects of American life that changed in the early 1930s, the Great Depression signaled the end to the popularity of the Mediterranean style as well. People went back to basics and the seemingly frivolous romance of the 1920s was seen as part of the problem. But this home, like several other Mediterraneans in the neighborhood, remain as a classy souvenir from the past, and a fine example of the diversity of architectural styles that make up our neighborhood. It’s all in the name: four square. Four sides of equal dimension, and each side equal in height and in width. In essence, that’s the four square house, though a variation on the style added a bit more space by making the front-to-back walls longer. These practical, attractive, stately beauties can be found in Alameda mostly north of the ridge, throughout Irvington, and in just about every other Portland neighborhood. The style was most popular in the 19-teens-Portland’s biggest residential building boom-and is seldom seen after the 1920s when builders and buyers turned their attention to the Tudor, the colonial, and other modern styles. Here’s a shot of a classic four-square, which ran in The Oregonian on January 21, 1912. The four square is almost always a two-storey house and is capped off with a hipped roof: a pyramid shaped top-hat that reflects the symmetry of the four walls. Sometimes the eaves extend out far beyond the walls with solid or ornate brackets (in a kind-of Prairie School style reference). Often four squares have a dormer or two up top which add a little head room to the attic and bring in some natural light. In the purest form, the interior floor plan of the four square was also (you guessed it) a square: four rooms of equal size, which ensured a corner for each space and precious cross-ventilation. Porches, ever-popular during the first part of the last century, almost always span the entire front wall. Interesting to note that lots of front porches simply wore out in the middle of the 20th Century. A review of building permits for the Alameda neighborhood shows a high frequency of porch demolition and reconstruction in the 1940s and 1950s. All that wood just couldn’t hold up against all that water. Sometimes the rebuilt porches, while practical and often concrete, left a lot to be desired historically. It’s not uncommon to see a lovely four square with a tiny porch roof just over the front door, with concrete stairs and wrought iron railings…clear clues to some early remodeling. Most four square houses have some visible influence from the Craftsman style, whether inside with door and window trim and other details, or outside in the form of eave brackets, window trim, porch columns or other details. That’s just natural: the builders who constructed these houses were also building bungalows and larger houses. And the Craftsman style was popular with home buyers and home owners at the time. Over the years, as styles changed, often these details were removed or altered to keep up appearances. A note about taxonomy: you might hear these houses referred to as “Old Portland Style.” Portland didn’t have a corner on the market for four squares…they are everywhere that homes were being built in the U.S. during this era. The Old Portland reference is a relatively new term, likely coined by realtors, that lumps together all two-storey, square, “boxy” looking houses. Don’t be fooled. Now you know: just look for four walls of equal dimension. Rooted in American history and tradition, the Colonial Revival style and its popular angled-roof cousin, the Dutch Colonial Revival, were some of the Alameda neighborhood’s earliest and sturdiest looking homes. The style takes it primary influence from New England homes of the 1700s and 1800s and is intended to call to mind the traditional American virtues of civility, practicality, and patriotism. 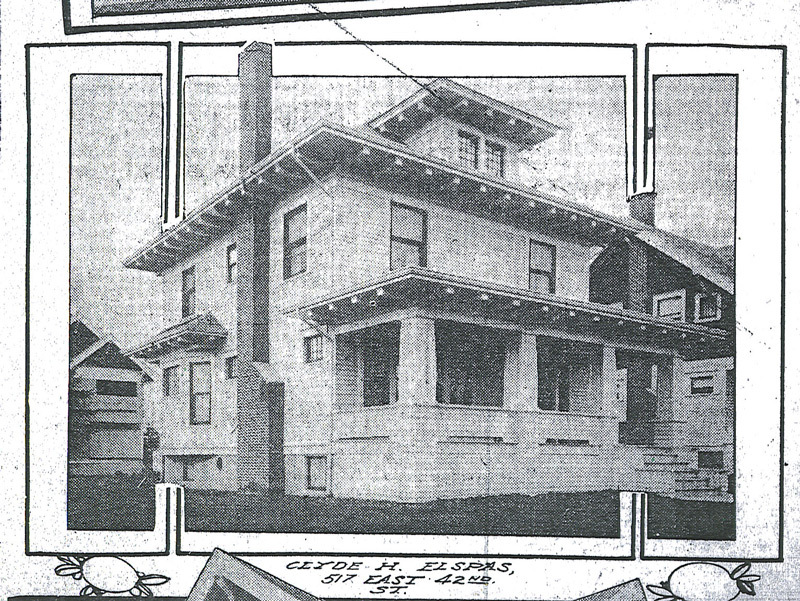 Alameda’s early builders were searching for designs that would appeal to the aesthetic interests of well-to-do buyers. The Colonial, and its variations, were an important part of the style palette for builders of that era. 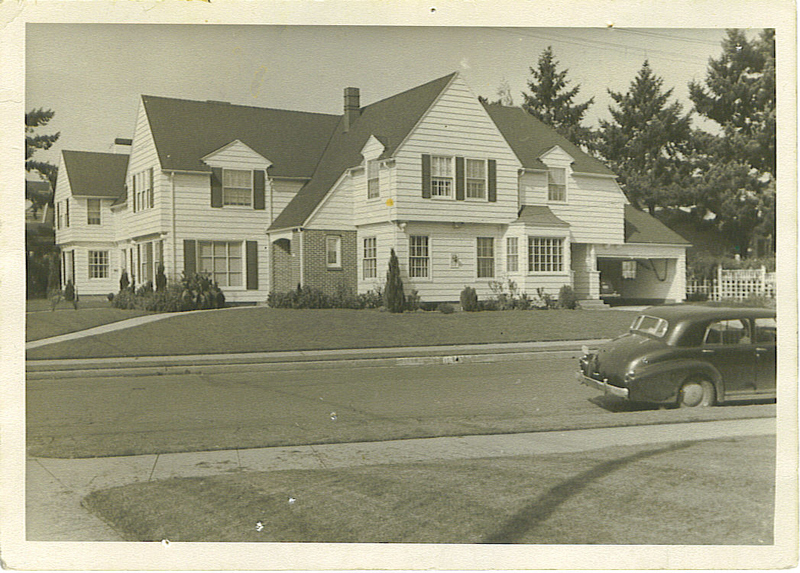 This Colonial Revival home at the corner of NE Regents and Dunckley was built in 1939 by Frank A. Read, a prolific Alameda builder of the 1930s and early 1940s. Use of brick around the entry door brings a modernizing touch to the traditional clapboard exterior. The plunging roofline from the roof peak to above the entry traces a link to early 17th Century New England homes. The use of a garrison style overhang between the first and second floor, and pendant drops at the corners, clearly ties the design to its colonial influences. Other Frank Read homes of this period use many of the same building materials and design references. Photo courtesy of John Haleston. While not the most common house style in Alameda, the Colonial and Dutch Colonial are notable because they mark both the earliest wave of building in the neighborhood during 1911-1912, as well as some of the last houses built on the dwindling supply of vacant lots in the 1950s. The early Colonial Revivals (such as the Harold Prince house at 2815 NE Alameda) are classic examples of the style, while the later homes more freely interpret the Colonial style and add in other influences like the bungalow or the Norman farmhouse. Decorative pendants, drops or spheres. Central (and sometime grand) staircases that lead direct from the entryway to the second floor. The Dutch Colonials often feature some or all of the features noted above, but have the distinctive angled roof, called a gambrel style (a barn-like roof) and are typically smaller than the Colonial Revivals. 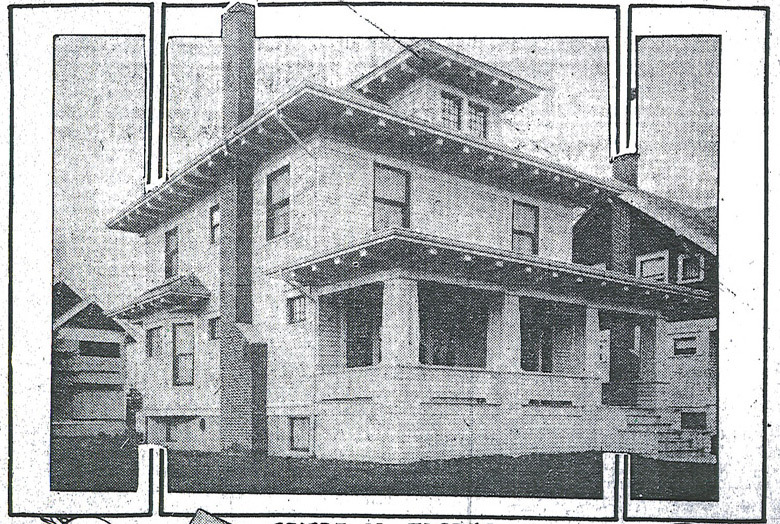 The most prolific designer and builder of the Colonial Revival in Alameda was Frank A. Read. Between 1926 and 1941, Read built 15 homes in the neighborhood, most of them Colonial Revivals, many of them clustered together in locations north of the Alameda Ridge. In addition to Read’s sense for design, he had good business sense for real estate development and for construction economies of scale. Located within 100 yards of each other in this portion of the neighborhood are a dozen other homes built by Read. The places where he chose to build were a quick walk from a stop on the Broadway streetcar which ran to 29th and Mason. Read was born in Portland in 1885 and lived on the east side most of his life. He died in June 1950, survived by his wife Mae and three brothers. His obituary in the Oregon Journal described him as a builder and contractor for more than 40 years. A great observation about old houses and their sometimes brash new neighbors. This column appeared in The Sunday Oregonian on March 16, 2008. Don’t you wonder what story the purple box is telling us? 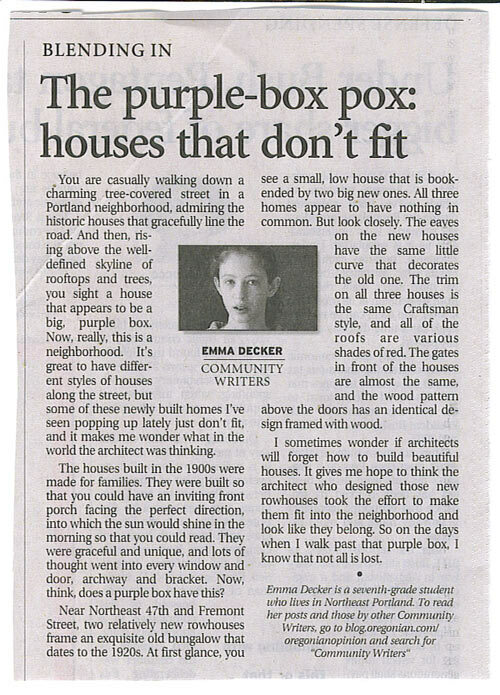 If the older homes were about family, and a love of making things that are handsomely decorated, or about sitting in the sun on our porches, maybe the purple box is about amnesia, or something like it. What do you think the purple box is telling us? 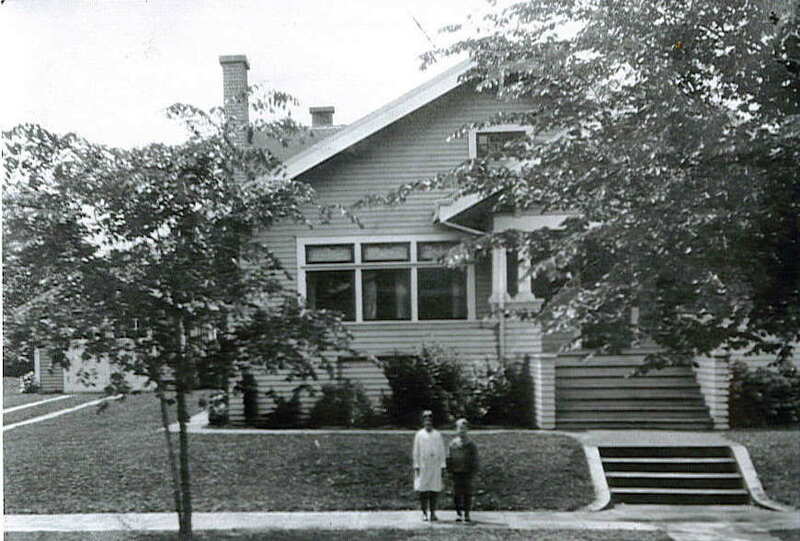 Jean and Robert Morrison in front of their Alameda Arts and Crafts Bungalow, about 1925. Note the front porch with squared columns, wide bank of casement windows, overhanging eaves and low profile, all hallmarks of the bungalow style. Photo courtesy of the Morrison-Munson family. If you’re passing through a residential area of Northeast Portland, (or southeast Portland for that matter) it’s impossible to be more than a stone’s throw from a bungalow. Distinguishing features of this much-loved style include its typical storey-and-a-half height, prominent overhanging eaves and front porch, often angular lines, and square-tapered columns. Indoors, family interaction was facilitated by a more open plan than the closed off parlors associated with earlier times. Larger windows, often in banks of two or three, invited natural light and fresh air inside and connected the home’s residents with the surrounding landscape outside. Rooted in the English Arts and Crafts movement – as much a social revolution as it was a design aesthetic – bungalow designs seemed to say solid, simple, natural, durable, practical, healthy, rustic. Some architectural historians credit this venerable building form with permanently altering America’s relationship with the home, breaking with pretentious Victorian and Queen Anne styles and putting a simple, attractive, dwelling within reach of would-be owners. While Portland didn’t invent the bungalow (credit is given to British ex-pats living in India), prolific local builders at the turn of the 20th Century got a lot of practice perfecting their style. 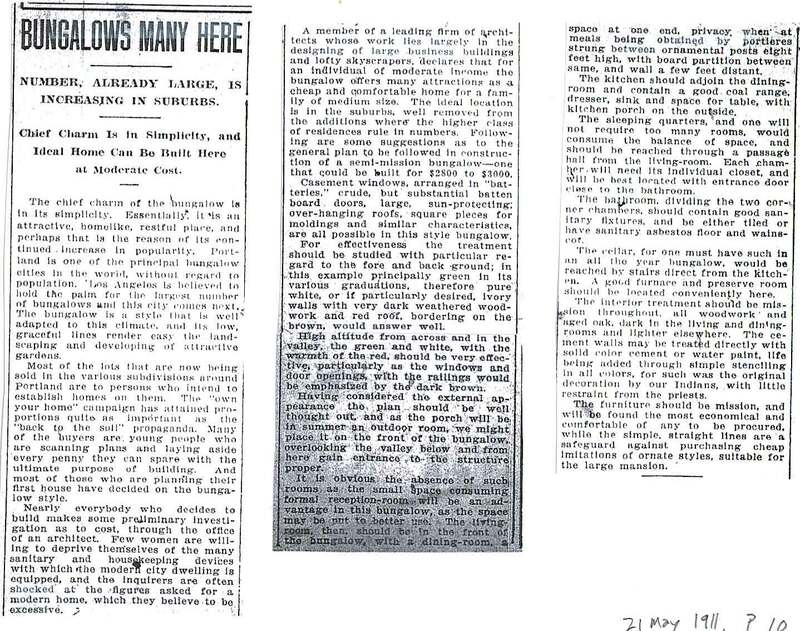 In mid-April 1912, perhaps the peak of our bungalow love affair, Portland was third in the nation behind only New York and Chicago in terms of the total number of building permits issued (667), two thirds of which were for homes…and many of them bungalows. From The Oregonian, 21 May 1911. Click to see larger image of this story. A testament to the cultural popularity of the bungalow can be seen in other segments of Portland life beyond housing: Movie theaters, community centers and even churches were built in the bungalow style. The Alameda Park Community Church near Regents and NE 31st, built in 1922 (now the Subud Center), was originally known as “the Bungalow Church.” Stay tuned for more in a future post on the story of how that original building came to be – it’s an interesting tale that includes a misunderstanding, a protest, a lawsuit and eventual neighborhood acceptance. The Craftsman / Arts and Crafts bungalow style was popular into the early 1930s, when the English cottage and Tudor cottage became more popular, as family sizes changed, and as the economy contracted. As homeowners’ design preferences changed, some of them remodeled (some might say remuddled) their bungalows to become more “modern.” Past owners of my house removed crown mouldings, portions of dining room plate rail, leaded glass and light fixtures as they pursued their vision of modernity. Fortunately, the solid bones of most bungalows have survived those bad ideas, and homeowners today have access to many resources and materials to restore the original look and feel of the bungalow era. It’s interesting to track development of our neighborhood simply by looking at house styles, with the bungalow, the four-square, and other Craftsman-style homes built first, giving way to the formal Tudor revival, the English cottage style, Spanish (we have a good few in the neighborhood), and Colonial influences. Today, there is a growing obsession with bungalow style that has given rise to at least one national magazine, dozens of books, friends groups, websites, conventions and retail businesses. The themes embodied in Portland’s first bungalows – family, simplicity, connection with the natural world, practicality – are very much part of our design ethic today. If you grew up in, live in, or just care about a bungalow, you have to read Janet Ore’s fine book The Seattle Bungalow, published in 2007 by the University of Washington Press. You might also want to check into the American Bungalow Magazine. What features make the bungalow special for you? 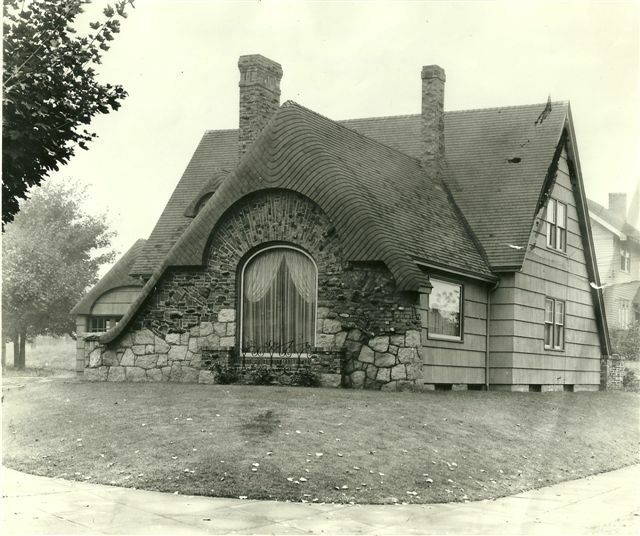 This Alameda Tudor Cottage, located at 3143 NE 32nd Place, was built in 1929 by architect and builder Albert H. Irwin. Irwin built more than 25 Tudor Cottage and Tudor-Norman farmhouse style homes in Alameda, Beaumont, Portland Heights and other locations. For more information on Albert Irwin, click into my page about The Builders. Photo Courtesy of Albert Irwin Collection-Paul Crocker. We’ll distinguish between Tudor Revival and Tudor English Cottage. But first, some background on key elements of Tudor. Based loosely on English style from 16th Century England-the period when the Tudor family ruled England-and evolved from a type of architecture and construction known as post and beam. Large timbers framed the buildings and plaster was used to fill in the areas inside the posts and beams (the ancestor of stucco), providing a rustic appeal. The form included steeply pitched roofs, elongated windows, often ornate use of patterned brick or stone, small window panes, a cross gabled structure, large chimneys (with chimney pots). Tudor Revival refers to those homes-usually larger and often two or three stories-built in Portland as early as 1910, though the style began to be used elsewhere in the country just before the turn of the last century. These larger homes mimicked the early post and beam style, but not the actual structural use of posts and beams, by using half-timbers affixed to a stucco exterior. Alameda’s “Autzen Mansion” near 26th and Alameda is a good example of a classic Tudor Revival residence. Tudor Revival homes were costly to build. Their steep and complex roof systems, decorative brick work, use of stucco and wood trim all took time and extra care. Why was the Tudor Revival popular? For many the style was attractive because of the reference it made to early England, to a more “romantic” time. At a time of great industrial growth and change, it provided a link to a “simpler” era. It was also a distinctive look, different from the Victorian and Queen Anne periods which it followed. These were smaller and more modest homes, built for middle-income families, usually one story. They were built on smaller lots, typically between the mid 1920s and late 1930s. The cottage version might have the half-timber over stucco style. But often not. The exterior material might be all stucco, or brick, or even shingle. Look for the long rectangular windows, and often-even on the cottage-use of leaded glass windows. The steeply pitched roof is still a common feature on these homes, as is a cross gable style…where the roof ridgelines run perpendicular to each other, with the gable end facing forward. The market for these homes in the late 1920s and 1930s was strong. Sears and Roebuck even produced a very popular kit version of this house. A study of Sanborn maps from the mid 1920s shows that much of the northerly portions of Alameda (and other nearby neighborhoods like Beaumont and Rose City Park) had been developed. The predominant house type built during the earlier years was the bungalow, though there are plenty of four-squares, arts and crafts and colonials as well. The English Tudor Cottage style was indeed popular and commonly used in the areas built after the mid-1920s, again typically in the southern and eastern portions of the neighborhood. Home construction was strong in parts of Northeast Portland in the late 1920s but then slowed after 1929 and didn’t really recover until the late 1930s. The English Tudor Cottage would have been popular during this era because it was less expensive to build and to buy; it had an attractive feel and look, with references to classic and higher-end homes; it was more “modern” compared to the common and aging bungalows that were all around; it was typically a bit smaller than homes built in the teens and early 1920s (smaller families). Be sure to take a look at the Tudor English Cottage plans and story that ran in the December 20, 1925 issue of The Oregonian. Click here for a link to that post.